Ensure you are running the latest version of Seqrite Endpoint Security for better computer data security. Upgrading to the latest version is important to improve network security, web security, company security, and data security. Multiple server installation is a unique feature of Seqrite Endpoint Security for best IT security management. Administrators can install the latest version of Endpoint Security antivirus where the previous version (i.e Seqrite Endpoint Security 6.1 or Quick Heal Endpoint Security 5.3 and below versions) is already installed. This feature enables Administrators to easily migrate to the latest version of Seqrite Endpoint Security in simple ways. 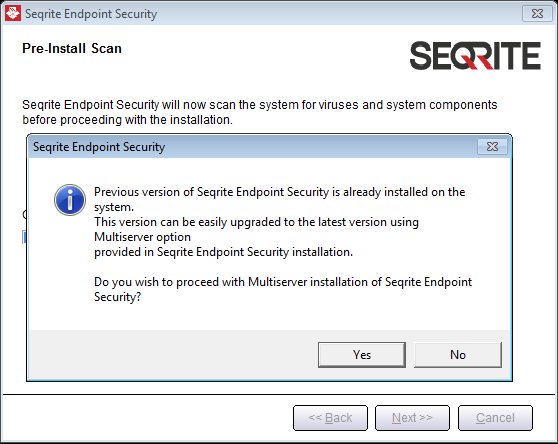 Install the latest version of Seqrite Endpoint Security on the system where previous version is installed. To proceed with multi-server installation, click Yes. Select Admin Settings > Server > Redirection. In the Server Name/IP text box, type the Server Name or IP Address of the latest version of Seqrite Endpoint Security. In the Port text box, type the port number of the latest version of Endpoint Security. This will send a notification to all the clients about the latest version of Seqrite Endpoint Security and all the clients will be redirected to the latest version of Seqrite Endpoint Security. The latest version of Seqrite Endpoint Security will check if there is any client of previous version in the network. If detected, Seqrite Endpoint Security will automatically uninstall the clients of previous version and install the clients of the latest version. Once all the clients are upgraded, you can uninstall previous version of Endpoint Security from the system. Before uninstallation, note down the product key and activation number, that will be required for re-activation of the latest version of Seqrite Endpoint Security. After uninstallation of previous version of Endpoint Security, re-activate latest version of Seqrite Endpoint Security with your existing product key and activation number. You can upgrade all the clients to the latest version within 30 days since the upgrades are available. If you have configured previous version of Endpoint Security site with IIS on Windows XP and 2K-based system and with SSL support enabled, you will not be able to configure later version of Seqrite Endpoint Security site with SSL support on the operating systems mentioned in the preceding section. In this case, you can install the latest version of Seqrite Endpoint Security with Apache Web Server. If you have installed a previous version of Endpoint Security, do not uninstall Apache Server during uninstallation of the previous version of Endpoint Security. During upgrade process if you encounter with any problem, please contact Seqrite Technical Support team.